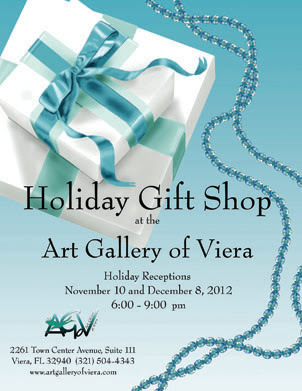 Art Gallery of Viera will have an opening reception for our annual Holiday Gift Shop which will run from Saturday November 10th from 6-9 pm.. A wonderful gift selection of unusual and unique gift items. A great time to meet and talk to the artists of Brevard County. 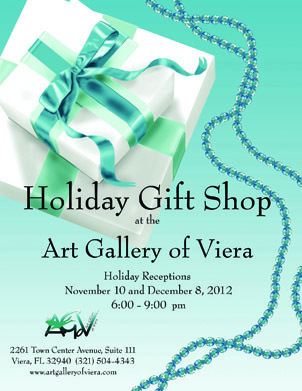 For more information, go to www.artgalleryofviera.com . The gallery is located in the Avenue at 2261 Town Center Avenue, Suite 111, Viera. (321) 504-4343. We are 3 doors to the right of Coldwater Creek.